I just love animal prints and I had painted a zebra hat santa before but wasn't gonna be satisfied until I painted a leopard hat on a santa ornament. Well, here it is! I want to do others also...an entire collection! Thanks for looking! This is my favorite Mexican casserole that I have made many times. Very easy and tastes so good. So creamy and just the perfect hotness to it. Going to have to make this soon! Enjoy! I have been so fortunate and feel so lucky to have lived at the lake full time for 9 years. Kentucky has been hit hard this week with over 12" of snow and the temperature has dipped down to negative numbers. I also am so lucky that I don't have to go outside of my home to work. I have worked outside my home since I was 16 so that would be 41 years of my life. I have to pinch myself that I have been able to stay home and paint my little heart out. I don't know how long this will last as I do feel really guilty not bringing more money to our checking account. So far, we are doing fine with only hubby's income but again, I feel guilty. He has to go out and work. My dream has always been to stay home and paint and make a living. Only glitch in that plan is that I don't really start selling my things until around August/September. Guess it is because I mostly paint Christmas ornaments. Can't help it, that is my passion. I am currently working on my inventory/stock so that I will have lots to sell come August. Anyway, back to lake living. Here are a few pictures of what my view looks like this time of the year. I am just so happy here! This view never looks the same...every day it changes. 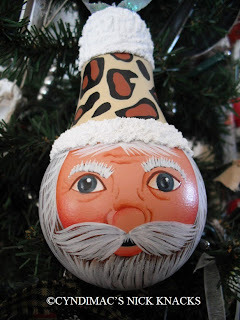 This little ornament has taken me quite awhile to get in the mood to design and paint. One of my best customers gave me the idea for it. I love getting ideas from others and I love designing new ornaments. New ornaments are quite time consuming because I have to not only draw it out but have to come up with what colors work well together. Since the elf has so much red in him I had no clue what color to do santa's coat but I knew that it had to be red too. So I painted a different color red from the elf's colors. Still not 100% sure the red coat will stay. Just can't figure out what other color would work better. I must confess, I don't use my crockpot very much at all but I would love to remedy that and try more recipes for it. This lasagna recipe is one that I found many years ago and make not often enough. I haven't done any major grocery shopping in the last week or two so I have been trying to just use what I have in the house and this is what I chose to make hubby for Valentine's Day. It was very yummy and oh so comforting. I even use regular lasagna noodles and they soften and cook just fine in the crockpot. That is my favorite part of the recipe, don't have to cook the noodles first. Enjoy! Brown hamburger in large skillet, drain. Spray crockpot with Pam. Spread 3/4 c. spaghetti sauce in bottom of crockpot. Stir remaining spaghetti sauce and tomato sauce into hamburger. Layer 3 lasagna noodles over sauce, break noodles if necessary. Top with 1/3 of the Alfredo sauce, spreading evenly. Sprinkle with 1 c. mozzarella. Top with 1/3 of hamburger mix, spreading evenly. Repeat layering twice, using 2 noodles in last layer. Sprinkle parmesan on top. Cover, cook on low 3-1/2 to 4-1/2 hours. Cut into wedges. Makes 8 servings. 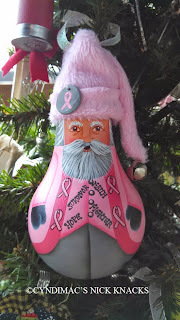 I have had lots of requests for breast cancer ornaments. My customers love to honor loved ones that have survived or are still fighting this horrible disease. I have had a few of these ornaments in my Etsy shop but knew in my mind that I wanted a santa with a pink coat added to the mix. This is what I came up with. I plan on painting a few a teal color as that is the color for ovarian cancer. I need some of those for my tree! Thanks for looking! This is a very EZ pizza recipe that I make often. It always tastes good! Only problem that I have with it is that I load it down so much that we often have to eat it with a fork. I sometimes like to add a side salad with it too. Preheat oven to 400 degrees. Roll out pizza crust onto pizza stone. Take a fork and prick holes into crust. Brush on a little oil over crust. Bake in oven for about 8 minutes. Take out pizza crust from the oven. Toss shredded chicken with 1/4 c. BBQ sauce or more. Spread remaining 1/4 c. BBQ sauce or more over dough. Arrange onion slices over sauce. Spread chicken over onions then top with cheese. Bake 15-20 minutes or until crust is golden brown. Sprinkle with fresh cilantro and slice into 8 wedges. I absolutely could not rest until I felt that my bride and groom collection is complete. 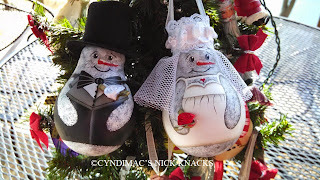 Sooo...I have painted this snowman bride and groom to add to the frogs, monkeys, gingerbread and penguins. I also have a Mr. and Mrs. santa bride and groom that I will share later. These can be personalized with the names and wedding date on them. They are in my Etsy shop. Cyndimac's Nick Knacks. 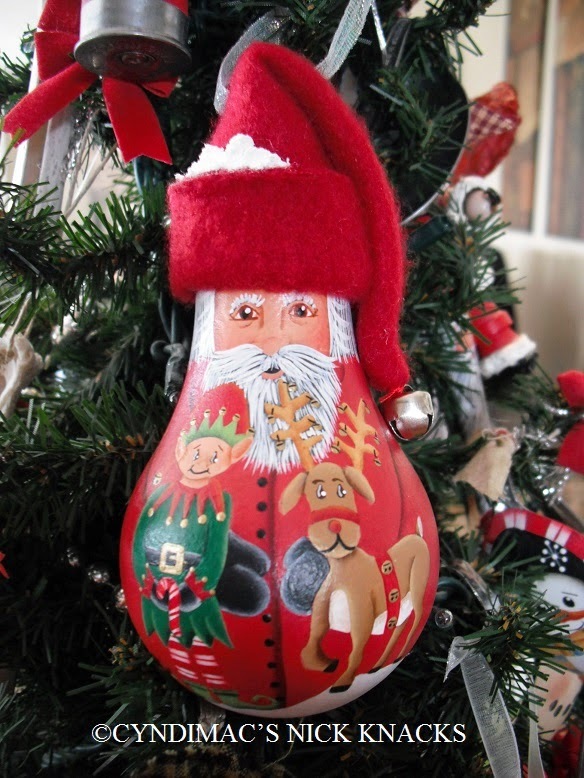 I have become a bit obsessed with painting santa suits on everything. Don't know why but I just love the simplicity of it. Fun to paint something that isn't too detailed and time consuming too I guess. Anyway, this is one of the spoon ornaments I painted for my sisters and sister-in-law this last Christmas. I believe next I am painting the suit on a small mini pop can. Still in this crazy, sort of unmotivated, not sure what to paint kind of mode that always hits me in the new year. So many things I want to paint but don't know where to begin. Working on a plan.